Home > Switch Review > Short 'n Sweet reviews: Nintendo Switch download catch-up! Short 'n Sweet reviews: Nintendo Switch download catch-up! The Nintendo Switch is really picking up some steam now. It's incredible to think that just a couple of months ago we were struggling to understand Nintendo's approach to the console, and whether there was a market for it. Now, we are quite happy to say that so far the company has well exceeded expectations, with not only a delightful bit of hardware to play with, but also a steady stream of games from both first and third parties to keep the console fresh in the hands. This week I'm catching up on some recently released Switch games that we haven't got the time to review in full. That's not to say they're not worthwhile, but as smaller downloadable releases, there are currently a lot of them, and I'd send myself a little crazy if I tried to do full reviews of them all. So here's the crib noted for four games you might want to consider dropping into the Switch's online store for. Zen Studios is a talented team of developers, best known for its work with pinball in the many (excellent) Zen Pinball tables that it has developed over the years. But back when the PlayStation Network, and other digital download services, were relatively new, it also released a minigolf title called Planet Minigolf. Back when digital download games were tiny, bite-sized experiences, this one was a real standout, thanks to its gorgeous art, and the sheer longevity on offer with the ability to create - and share - minigolf holes thanks to a very robust editor. 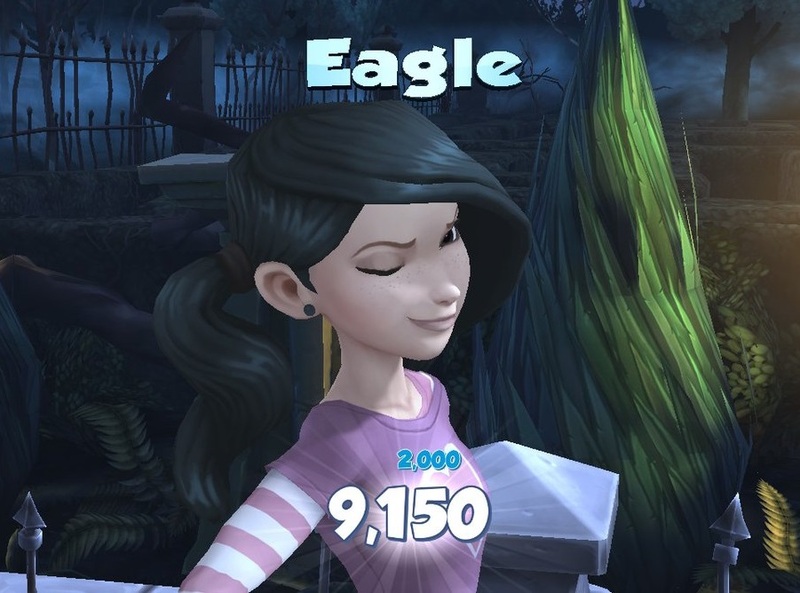 Now Zen Studios is back with Infinite Golf. Not much has changed in the years since Planet Minigolf, but the not much needed to. This is still an excellent little game, and it’s a good fit for the Switch’s portable functions. There are three “themes,” and the default game is broken up into four sets of courses in each theme - a Micro Machines-like bedroom environment where all the furniture and toys are huge, a haunted Halloween-themed environment, and a Christmas-themed environment. Before even delving into the player creations that means 12 different courses, and across three difficulty levels to boot. Actually getting through all of this takes work, especially since the challenge level does ramp up significantly. And then you’ve got the robust level creation and online sharing features, and these are truly superb. You can make some incredible courses using the toolset, and then access thousands of levels - some of them looking utterly impossible, from the community. Of course, whoever creates the course has to complete it themselves before they can upload it, so you’ll know that it is possible. The trick is to then figure out how to do it. Infinite Minigolf indeed. Overcooked is a delightful little casual game that is best enjoyed playing with someone else. So it’s just as well that the Switch has two detachable controllers and a screen sitting right there making it the perfect console for this exact kind of game. Related reading: Matt's review of the original game on PlayStation 4. 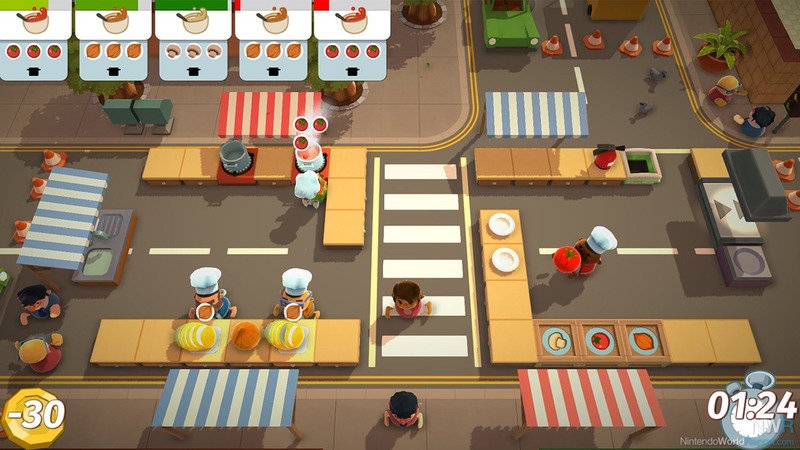 In Overcooked you play as a team of two chefs, who need to cook up a variety of dishes as per customer orders. A burger requires the duo to chop up lettuce and tomato, tenderise and then sizzle up a cut of meat, and then stick it all together with a bun, before delivering it to the customer and then washing up their plate. Tomato soup, on the other hand, requires three tomatoes chopped up and some boiling time, as well as the busywork of serving the meal and cleaning up afterwards. There are plenty of conditions that make things harder - for just one example one level early on that has frequent earthquakes that split the kitchen in two and then rejoin it. As a result of all this, at any point in time there are a large number of things to try and manage, and the intensity of the game as a time management title is quite high. I find it stressful as a single player, because you can only control one chef at a time, and seeing another chef standing there unused, or having finished his task and waiting idly for the next, makes it hard for me to concentrate and establish a routine, but in multiplayer it’s a lot more fun, since communication is all you need to get a really good result (or you can play in competitive levels for some alternative fun). The game looks gorgeous and has plenty of personality, and on the Switch you also get all the DLC, which adds even more value to the overall package. More than anything, though, the ability to detach the joy cons from the Switch unit and get a two player game going anywhere is a brilliant use of the technology, and makes Overcooked feel like it was designed for the console from the very start. Match-3 games are dime a dozen, so it’s hard for any of them to really stand out. Boost Beast is another example of that. It’s adorable and cute, but with well over 200 levels, the grind becomes real and tiring with three quarters of the game still to go. The premise of the game is that zombies have attacked the planey, and you’re a king dog that can command other animals to sacrifice themselves for the cause of beating back the menace. Each animal is colour-coded, and so are the zombies, and the only way that an animal can defeat a zombie is if it’s of the same colour pink rabbits are the only things that can kill the pink zombies. 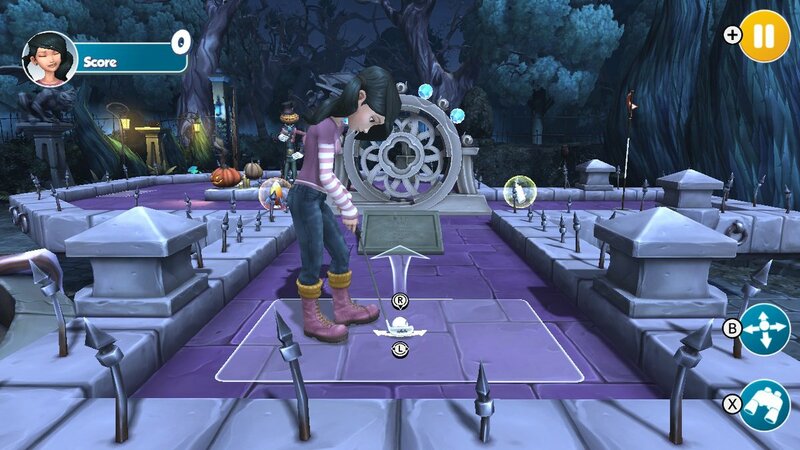 You summon the animals to fight by matching tiles on the match-3 board, and as you get deeper into the game special conditions start showing up, such as gravestones, which make the zombies invulnerable unless you remove the gravestone from the playfield first. And, every so often a boss shows up to make things even more difficult. And that’s about the extent of the game. It’s clean match-3 experience, and the art is just gorgeous and cute, but it’s hardly innovative. It’s also let down by some boards that require a specific approach and tiles to clear. Unfortunately because what appears on the board is randomised, there’s no guarantee that those boards are even possible to complete with the 'hand' that you'll be dealt at the start. There are times I needed to restart a level a number of times just to get the combination of tiles that I needed, and that was needlessly frustrating, above and beyond the inability for the game to keep me interested in the later half. This is surely the most casual game on the Switch to date - not that that's a bad thing by any means, it's just a little tonally odd to be playing on the console at this stage. It’s not even really a game-y, but rather an outlet to enact the same kind of compulsive action that a sheet of bubble wrap does (pop, pop, pop, WHY CAN’T I STOP?!?!). 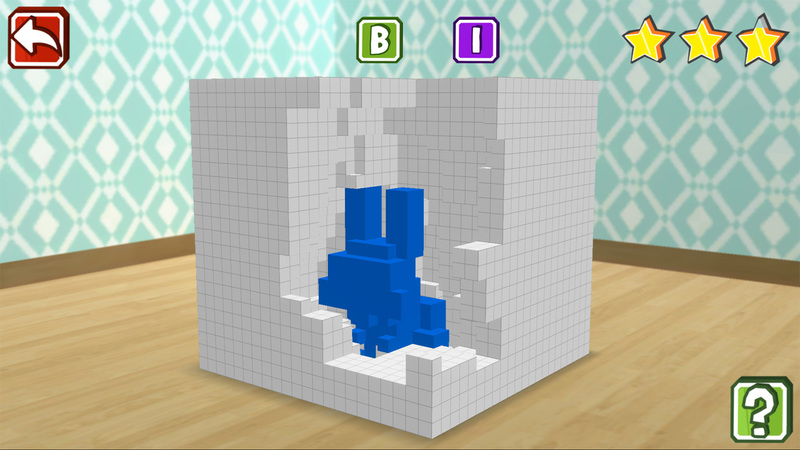 With Qbics, you’ve got a big block of little white blocks that you need to chip away at to reveal a shape underneath. There’s no pressure to do it fast or in a certain number of “taps.” There is a small penalty to tapping on a shape when you’ve already revealed it by accident, but for the most part you’re just meant to take your time and slowly whittle the block down. When the shape has been revealed in full you’re then given the ability to paint the thing. Not for any particular reason. Just because it’s fun to colour things in. When you’ve done that you can take a screenshot of your masterpiece and then set about tapping down the next shape. It’s a pointless time waster, but it’s a fun way to relax the mind with something mindless in short burst. The “game” itself works just fine on the Switch, but given that all you’re doing is tapping little cubes to make them disappear, you’d hope that was the case. It probably sounds like I’m being hard on the game, but I actually do enjoy it. Aside from a grating music score, there’s something very zen to it, and I find myself playing it quite a lot before I go to sleep as it does relax my mind right down. I just struggle to understand where the audience will be for it on the Switch, is all.